HART (Highway Addressable Remote Transducer)is a bi-directional communication protocol that provides data access and interfaces between intelligent field instruments and host systems. A host can be a technician's hand-held device, or laptop, a plant's process control, asset management,or other system using a control platform running a software application. HART Field Communications Protocol extends this 4-20mA standard to enhance communication with smart field instruments. Acting as a modem the protocol preserves the 4-20mA signal and enables two-way digital communications to occur without disturbing the integrity of the 4-20mA signal. Unlike other communication technologies, the HART protocol can maintain backward compatibility with existing 4-20mA systems. HART is a master/slave protocol which means that a field (slave) device only speaks when spoken to by a master. The HART protocol can be used in various modes for communicating information to/from smart field instruments and central control or monitoring systems. HART provides for up to two masters (primary and secondary). 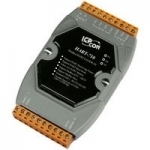 The HRT-711 HART Interface allows a Modbus TCP master to access HART devices such as a transmitter or an actuator etc. The HART-710 HART Interface allows a Modbus master to access HART devices such as a transmitter or an actuator etc. Profibus DP to HART Gateway unit for adding HART slave devices into a Profibus DP network.